I think every single one of us has experienced a dark dot in his/her sight when looking at a white surface such as a white ceiling, there's something in our eye that with a little focus we can see it, and when we move our eyes around, that thing floats around quickly in your sight. It's like a substance on eye's surface, I want to know what is it called. Hope I'm clear enough. You're probably thinking of floaters. 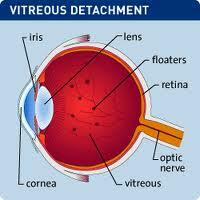 Floaters are suspended in the vitreous humour, the thick fluid or gel that fills the eye. Thus, they follow the rapid motions of the eye, while drifting slowly within the fluid. When they are first noticed, the natural reaction is to attempt to look directly at them. However, attempting to shift one's gaze toward them can be difficult since floaters follow the motion of the eye, remaining to the side of the direction of gaze. Floaters are, in fact, visible only because they do not remain perfectly fixed within the eye. Floaters are deposits of various size, shape, consistency, refractive index, and motility within the eye’s vitreous humour, which is normally transparent. At a young age, the vitreous is transparent, but as one ages, imperfections gradually develop. The common type of floater, which is present in most people’s eyes, is due to degenerative changes of the vitreous humour. The perception of floaters is known as myodesopsia, or less commonly as myodaeopsia, myiodeopsia, myiodesopsia. They are also called Muscae volitantes (Latin: "flying flies"), or mouches volantes (from the French). Floaters are visible because of the shadows they cast on the retina or refraction of the light that passes through them, and can appear alone or together with several others in one’s visual field. They may appear as spots, threads, or fragments of cobwebs, which float slowly before the observer’s eyes. Since these objects exist within the eye itself, they are not optical illusions but are entoptic phenomena. The overarching term for all these shadows in the eyes is entoptic phenomena. As the term implies the source of these visual effects is the eye itself - floaters (including the blood corpuscles), Haidinger's brush, branching patterns, and the flying gnats for instance. As these are real images cast upon the retina, they are not optical illusions. Under suitable conditions light falling on the eye may render visible certain objects within the eye itself. These perceptions are called entoptical... it is only under special circumstances ... that these shadows become visible. Oh, squiggly line, it's all right. Musca volitans & Myodesopsia are medical terms for it. You may be referring to the "fovea"; the dark spot on the retina that is the attachment site of the optic nerve. Is there a word for those random spots/patterns you see when you enter your home after playing outside on a sunny day? What is the aural equivalent of eye-witness? Word for “Can't be seen with the naked eye”? What's the usual name for a 'dot' billboard? Synonyms for black eye without the word “eye”? “Tall, Dark, and Handsome” Character Archetype?